Editor's Note: This is the second installment in a four-part series analyzing the outlook for small businesses in the year ahead. Read the first installment here. The credit crunch for small businesses is expected to ease this year, but entrepreneurs may still need to be creative in their search for financing. "The lending market for small business in 2012 is going to be much better -- the best year after the recession," according to Rohit Arora, CEO of Biz2Credit, an online credit marketplace in New York that connects small and midsize businesses with lenders. Securing loans with a good rate won't be easy, however. "It is going to continue to be a fight and a struggle to get small-business owners capital at fair prices," says Ami Kassar, CEO of MultiFunding, a small-business lending consulting firm in Broad Axe, Pa. "It is going to take a long time for us to work our way through this situation." Many entrepreneurs will have to do what they do best: Be resourceful and find new solutions to their funding problems. Already, a few alternative funding sources are becoming increasingly popular and likely will gain more traction in 2012. Related: Should You Tap a Nest Egg to Start a Business? For example, more business owners may turn to crowdfunding sites, such Kickstarter, IndieGoGo and RocketHub, to raise small amounts of money from large pools of investors–especially if the Securities and Exchange Commission eases rules on such transactions. Kickstarter alone has seen more than $125 million in pledges since its inception in April 2009, according to Justin Kazmark, spokesman for the New York company. One business raised almost a $1 million from more than 13,500 backers in December 2010, setting a record. At the same time, such companies as SDCooper, Benetrends and Guidant Financial have gained momentum. For a fee, the firms help entrepreneurs roll over their retirement savings into new businesses or franchises, avoiding early-withdrawal fees. Guidant, in Bellevue, Wash., says its revenue grew over 25 percent in 2011 and is expected to increase 17 percent in 2012 as more people try this approach. Of course, raiding retirement funds is risky because entrepreneurs could lose their nest eggs. 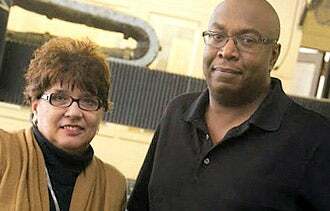 Linda Jamerson and her husband, Ken McDonald, bought the Aluminum Case Company in Chicago. But for new business owners Linda Jamerson and husband Ken McDonald, the risk was worth it. Unable to acquire sufficient loans from banks, the couple used Guidant's help to set up a new retirement plan through which they were able to buy Aluminum Case Co., a small manufacturer of aluminum metal cases in Chicago, in April 2010. The company's sales grew 60 percent the first year after the couple took over, and it has hired a part-time and two full-time employees. Jamerson says she is willing to tap retirement savings after watching her IRA lose 40 percent of its value during the financial crisis. "To run your own business, you have to believe in yourself and we did," she says. But, "nobody was going to give us the money so that we could get in." Bank loans: The collective bank loan balances of small businesses have fallen more than 10 percent over the past four years to $610 billion in June of 2011 from $681 billion in June of 2007, according to FDIC data compiled by Kassar of Multifunding. While large banks sharply cut lending to small businesses, community banks are actually providing more loans. Since 2007, small-business loan volume at small banks grew by $17 billion to $302 billion, as of June 2011. "The disparity is not going away any time soon," Kassar says. Community banks are better equipped to handle the nuances small-business loan underwriting, he says, whereas bigger banks have a more "rigid" process and generally work only with the most creditworthy borrowers. At a smaller bank, loan officers work on site with business owners to help clarify any questionable parts of an application. Small Business Administration loans: SBA lending reached the highest level ever in its fiscal year 2011, which ended Sept. 30. The SBA backed 61,689 loans totaling $30.5 billion, a big jump from the 50,830 loans totaling $17.9 billion two years earlier. Risk-averse banks may prefer making SBA loans because the government guarantees as much as 85 percent of the loan in the event of default. But there are still areas of weakness, particularly smaller loans. While the number of SBA loans greater than $250,000 increased by 52 percent over the past two years, loans of less than $250,000 rose just 13 percent. Venture capital: Venture-capital firms, which invest in early-stage, high-growth small firms in exchange for a portion of the company, have started to loosen their purse strings. In the first three quarters of 2011, the venture-capital industry made 2,725 investments worth $21.2 billion, compared with only 3,056 deals worth $19.7 billion in all of 2009, according to an industry report from Pricewaterhouse Coopers, the National Venture Capital Association and MoneyTree. In the year ahead, the venture-capital industry will likely be roughly in line with 2011, says Mark Heesen, president of the National Venture Capital Association. But uncertainty abounds. "There continues to be concerns about what happens in Europe, the budget crisis in the U.S., the Arab Spring, all of these things coming together," Heesen says. Even if the number of dollars invested is flat, he says, the number of new companies receiving funding may decline. When venture capital firms have to make a choice, they are more likely to invest in their existing companies than take on new risks. Angel investing: Angel investors are becoming a bit less cautious, too. These investors--high net worth individuals who help fund startups in exchange for a percentage of the company down the road--provided $8.9 billion in the first half of 2011, up nearly 5 percent from the same period a year earlier, according to the University of New Hampshire Center for Venture Research. The $8.9 billion went to 26,300 startups, for an average investment of $338,400. "I don't see any big run-up in dollars in 2012. If we see a flat market or a 5 percent growth rate, that would be reasonable," says Jeffrey Sohl, director of the Center for Venture Research. Angel investors "are still doing deals, they are just doing deals at a smaller amount." Asset-backed lending: Asset-backed loans, which are based on the value of collateral, have become more popular. Although they are often more expensive than a regular bank loan, businesses often turn to asset-backed lenders when they don't have the track record to qualify for a traditional line of credit. In the third quarter of 2011, businesses were making greater use of their asset-backed credit lines, with 40.5 percent in use compared with 37.2 percent a year earlier, according to a survey of members of the industry group Commercial Finance Association. That marked the third consecutive quarter of increased utilization of the credit lines. "Typically, you have seen that when the economy is a little bit shaky, you see more activity of asset-backed lending," says Andrej Suskavcevic, CEO of the CFA. Next year, he says, the volume of asset-back lending is expected to be flat with 2011. Tomorrow's installment will take a look at small businesses' hiring plans in 2012.